According to the Chicago Public Libary's Information Center, a 35th wedding anniverary is the coral or "jade" anniverary, while the 50th is the "golden" anniversary. Drum Workshop, or DW, simply couldn't wait, so they threw their golden anniversary 15 years early. And with a bass pedal this stunning, who could blame them? 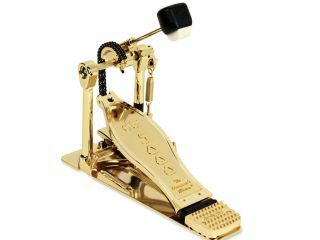 The DW 5000AD3 Accelerator Chain-Drive Single Pedal features a host of refinements and upgrades to its original, performance-proven design. The 5000AD3 features a strap drive accelerator (offset cam) system. It also features an aluminum hex shaft, pedal plate and linkage, stackable heel plate, dual/side adjusting hoop clamp, 101 two-way beater, built-in spurs, plus all the versatility, adjustability, and reliability that allow players to customize the feel and performance to fit the way they play. Includes pedal bag (not gold-plated -- sorry). U.S. list price is $833.99. And hey, it's worth its weight in...you know what.